31-35 Gallowgate, Glasgow. G1 5AA. Tel: 01415522690. Chrystal Bell & Co. 2005. This pub is steeped in history, better known as the Chrystal Bell's or Chrystal Bell & Co. Other names this old hostelry has had over the years is Rutherford's and the Royal Albert. To read the full history of this historical landmark click here. When these premises were known as Rutherford's, Mr Cameron a strapping Scotsman managed the premises, he was succeeded by Mr Wylie who had held for years the same position. Me Cameron was something more than just the ordinary man behind the bar. He was well educated and had some artistic predilection which he gratified after hours. He was an accomplished elocutionist and had ability which even a professional might envy. He was a member of a well known Glasgow society which existed for proficiency in elocution and Mr Cameron years ago was one of it's brightest members. 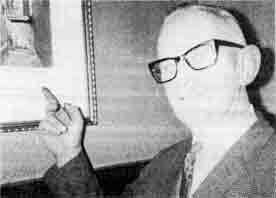 Charles Sheridan, manager of the Chrystal Bell & Co, Gallowgate. 1970. 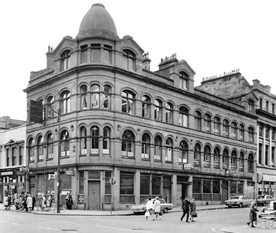 The Chrystal Bell & Co., was taken over by Scottish & Newcastle Breweries in 1965 and refurbished the old premises. One of the executives in the S & N furnishing department was inspecting the vast cellars below the premises and stumbled upon a book of photographs of mid-Victorian Glasgow. The set of plates provide a remarkable record of the social life of some of the oldest areas of the city. Their value and the atmosphere they could lend to the old-fashioned Chrystal Bell were quickly realised and the photographs were soon framed and fixed to the walls of one of the bars and the restaurant. Chrystal Bell & Co., 1960s. This way to the Chrystal Bells. So many of the pantomime pubs of Glasgow see pantomime no more. The pubs are still there, but the theatres have gone. And as far as pantomime is concerned we have only two this season. I can remember when there were nine pantomimes running in Glasgow. Even just after the last war we had 11 theatres operating in the city. Before that war we had even more in and around Glasgow. Tommy Morgan told me that, as a young comic, he could do 19 weeks in a different theatre every week and reach them all by tram car! Alas, the glory has departed, and I'm referring to the tram cars as well as the theatres. You can go into some of the old pantomime pubs to-day and not find a single soul who remembers the theatres beside them, except, perhaps by name. This of course, is because pubs have changed ownership and the barmen and barmaids who could exchange pleasantries with the principal boy, the sister act, the comics, the "heavy" and the orchestra have sought fresh woods and pastures new. 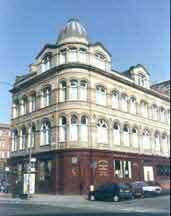 One of our great pantomime theatres was the Queen's in Watson Street, beside Glasgow Cross. It suffered from the occupational hazard of old Glasgow theatres, a fire. The Hall family who ran it, decided not to rebuild. But before, during, and after the war it was the mecca of those who liked pantomime in the rough. The stars of the Queen's pantomime were Frank and Doris Droy, Billy Fields and Sammy Murray. There was no bar in the Queen's because, many years before when, it was the Star Music Hall, there had been a fire scare in the middle of a show and several people were killed rushing down the steep staits into the street. But in every Queen's Theatre pantomime, in the act before the interval a notice would appear somewhere on the scenery, whether it be a wood, a palace, a kitchen, or a polis office, saying "This Way To The Chrystal Bells." This referred to the pub opposite the pantomime, a pub which still bears the name of the proprietors, Messrs Chrystal and Bell, although it belongs to the brewers now. Since there was no bar in the theatre the audience, the orchestra, and quite a few of the cast crossed over the road at the interval and between the two houses. The Queen's pantomime was a twice nightly show and the top price for the stalls was 9d. The pub was constantly mentioned in the pantomime. A favourite gag was when Sammy Murray, as Dame Fanny Cartwight whatever the name of the show, showed his "Feed" a photograph. "That's a photie o' ma murray ootside ra Chrystal Bells," he would explain. The "Feed" would examine the picture carefully, then say - "I see the Chrystal Bells, but I don't see your mother." "Ma good," Sammy riposted, "is she in therr agane?" Well I went into the Chrystal Bell the other night and found it had a Victorian air which I didn't remember. The present owners have done it up with imitation gas lamps,a lot of red trimmings, and a notice which promises much gastronomical delights as mince and dough balls, tripe and onions and pig trotters. I doubt, though, if you can get them. The place had a more functional air on the occasion we took Binnie Hale to see the Queen's pantomime and at the interval to the pub, Binnie Hale was enchanted by the whole affair, but especially by the Jackson Sisters, who were capable of singing six different songs in six minutes and dancing at the same time. Well I couldn't find a single soul who remembered the great days of the Queen's, so I went up Watson Street and round the corner to the House of Lords in Bell Street. It used to be Kelly's Pop Inn, but it was the House Of Lords when Frank Droy took me there to discuss a B.B.C. broadcast. Frank always wrote the script for the Queen's pantomime. We think we're "permissive" to-day, but you should have heard what they said at the Queen's. The police were worried and, when they found the script had not been submitted to the Lord Chamberlain, they insisted on this being done. Well Frank Droy wrote his script in pencil in a B2 jotter, so he sent the jotter to St. James's Palace. Maybe it was because it was in pencil, or maybe because it was written in lovely Glasgow dialect, but the Lord Chamberlain passed it. The police were non pleased, and every night the audience roared at jokes I wouldn't dare repeat in these pure pages. The reason that Frank Droy had made an assignation with me in the House of Lords was that, when he went to Chrystal Bell, he was inundated with others of haufs, pints, "hale Yins," and the like. On this occasion he wanted to escape the adulation and discuss serious matters. The pantomime at the Queen's that year was "Robinson Crusoe," in which Doris Droy insisted on eaiing "Robertson Crusoe," and what I wanted to know was why the principal boy was called Colin. Frank couldn't understand what I was talking about. "Our principal boy's always called Colin," he explained in a kindly manner, as if he was talking to a half-wit. "We could do anything there," he said. "I remember the time when we put on an earthquake in one of the pantomimes. You should've seen it. Better than the real thing!" There were no earthquakes at the Queen's, but one of my companions did mention a world-shaking event which occurred there. "Here," he said, "didn't you appear as the hind legs of a horse in one of the pantomimes?" I admitted it. That year Doris Droy was appearing as a woman carter and her horse was performed by Carr and Vonnie, Jimmy Carr is still appearing with Lex McLean, For one performance only I took Vonnie's place as the hind legs. And here was somebody who remembered! I left The House of Lords feeling Like Laurence Olivier. By Jack House. Did you know that the Chrystal Bell & Co. was in the video of Robson & Jerome - What becomes of a broken hearted.